Halloween is almost here and it’s time to start planning for those parties! This quick and easy trick for boiled eggs will leave your ghosts and goblins begging for more Monster Eyes after Halloween has come and gone! Start by boiling your eggs until done. Let them cool, then gently roll them back and forth on the counter-top until they are lightly cracked all over… but don’t peel them. Set the eggs aside and mix a small bowl or cup with the hot water, along with about 10 drops of red food coloring. Gently drop the eggs into the colored water and let sit for about 5 minutes. Remove the eggs from the water and lay on paper towels to dry. Once dry, peel the eggs and cut into halves. Then, take a sliver off the top of each half so the eyes sit flat. 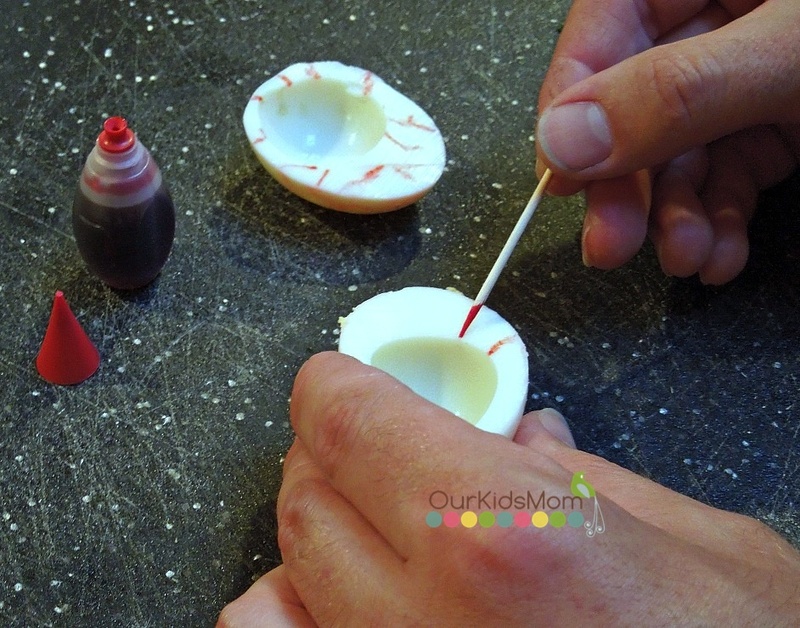 Use a toothpick dipped in red food coloring to draw red lines onto the sides of the egg halves, giving them a bloodshot look.